Paul Foster Johnson’s Refrains/Unworkings Now Available! 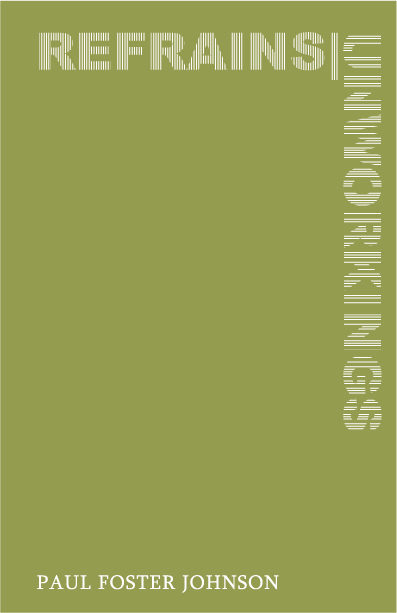 Refrains/Unworkings is Paul Foster Johnson’s first book of poetry. Juxtaposing Romantic ideology against a postmodern disregard for “found” or “authentic” meaning, where “everybody’s ontological investigation/ is guided by anticipated findings,” these poems explore the social space of sound and rhythm and rhetoric. These are love poems, too, paeans so private and so simultaneously public, they evoke a contemporary return to Hart Crane’s White Buildings. Yet, the speaker here resists the totalities of lyric history and their familiar arguments of selfhood: Romantic Man of Taste, revenant noisemaker of the New York School, vatic observer of the Republic, gay poet. Every new utterance is already old—already within limiting quotation marks. Johnson’s clever answer to the problem is a complex recapitulation and revision of lines, phrases, sounds, and images, where even entire movements of a poem are “refrained” but re-contextualized in later poems. Nowhere is this more evocative than in the bookends of Refains/Unworkings. In the first poem, “Rhythmicon,” there is only the voice “without anchor,” a “birdsong of institutional being,” a voice wherein art is without purpose even while the urban bourgeoisie search for new theories of art. In the last poem, “Art of the Cities,” the same sentences of “Rhythmicon” form new lines within the context of polis and socius— post-9/11 New York City— where new construction ultimately leads to monumentally empty glass buildings and memorials to grief, perseverance, and failure. Paul Foster Johnson is an editor at Litmus Press. With E. Tracy Grinnell, he is the author of the chapbook Quadriga (gong press, 2006). From 2003 to 2006, he curated the Experiments and Disorders reading series at Dixon Place. He currently lives in Brooklyn, New York. The book is NOW AVAILABLE through SPD. This entry was posted on Friday, September 26th, 2008 at 9:26 pm	You can follow any responses to this entry through the RSS 2.0 feed. Mr.Paul Foster Johnson Have you really read VULGAR LIVES? Do you think we could have a friendly, kind of a critique(ing) relationship on the book I’m working on now? I have no-one to try it out on. No-one to get an initial reaction from. What I’ve done perplexes me, especially the ending that seems to belong somewhere else.